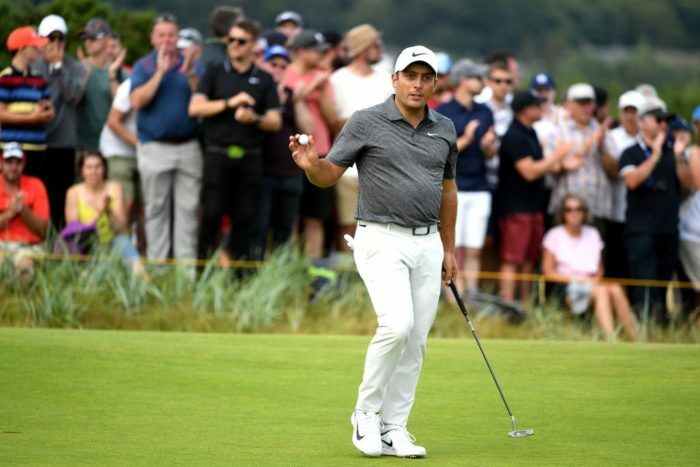 Francesco Molinari produced a flawless final round to claim the Claret Jug and become Italy’s first Major champion at The Open at Carnoustie, writes WADE PRETORIUS. It was a Sunday for the ages – not a repeat of the titanic Stenson vs Mickelson duel from two years ago but rather an 18-hole exhibition when any number of 10 players could’ve won. First, and before the wind and Carnoustie showed its mean streak, it was England’s Eddie Pepperell and his 67 that set the mark at -5. With overnight co-leaders Jordan Spieth, Xander Schauffele and Kevin Kisner at -9, that might’ve not looked formidable but as the day unwinded, it almost looked enough. Justin Rose, who birdied 18th today and all three previous rounds including on Friday to make the cut, was consistent as ever as an eagle on 14th and, that fourth birdie of the tournament at 18th, saw him edge ahead of his countryman as the new clubhouse leader at six under par. And that’s when the drama unfolded. Tiger Woods, winner of 14 Majors and looking to write one of sport’s greatest stories, played his way into a share of the lead and then the lead outright after Schauffele went bogey, bogey, double from the 6th. The crowds around Woods swelled but like he’s done on multiple occasions this season, he slipped away almost as fast as he arrived. The crowds, however, remained. They were in place to follow the eventual champion, Molinari. The Italian said yesterday that the final round was about making as many pars as possible. Perhaps, it was taken too far after going out in nine straight pars to hover in the pack of challengers without ever laying down a serious marker. In pursuit of his own glory, Rory McIlroy was attempting to play the opposite of Molinari; his plan was all out attack and while the putter was indifferent, it did land him an eagle on 14th and help save par more than once on the way in as he joined Rose in the clubhouse on -6. That number looked in grave danger of setting up at least a four-way playoff with Molinari, Spieth and Schauffele all looking at easily matching that tally. That number looked modest after Molinari and later Schauffele birdied 14th. It was developing into a two-man shootout, with those in the clubhouse hoping the nefarious final stretch may yet offer up a late surprise. It did not as Molinari proved fearless. Faultless. Flawless. A precision tee shot on 17th was followed by arguably the shot of the tournament, or at least the one that installed Molinari as the heavy favourite, as his 2-iron rolled onto the green. A missed putt was of no concern as par was always a valuable commodity late on the day. A perfect drive on 18th followed by an exquisite wedge left the 35-year-old within a few feet of eight under par and one hand on the Claret Jug. Molinari rolled in the putt, let out a massive burst of emotion and moved into the clubhouse to wait for the inevitable declaration that he was indeed, better than all. Young American Schauffele, who battled bravely all afternoon in the wind of the Angus coast, attempted to delay the coronation but failed with a putt on 17th to save par. This was Molinari’s time. His day. His perfect day.